I have my full time studies resuming for this semester this week and they look like they're going to be taking a ton of my time. I wanted to comment though on something I read in the paper this morning, seems some people in Australia still support the idea of keeping states. 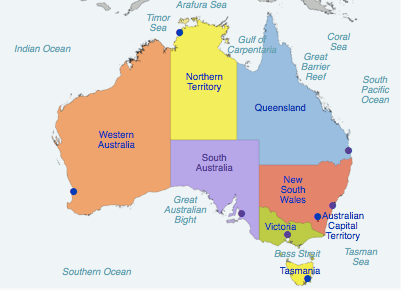 I guess given I've lived overseas and in four different states in Australia (New South Wales, Victoria, Queensland, South Australia) I've never seen the point of states. To me they're relics of the colonial days that we've unfortunately lugged with us to the present along with the British Monarchy that don't serve us any purpose now and in some ways actually hinder our progress. I've seen little evidence that having an extra layer of government and bureaucracy improves our lives or representation; all I see is duplicated effort, wasted money and lots of infighting. I think when we live here we tend to forget that Australia may be a vast country, but we have a tiny population. When people in South Australia complain that the huge populations in the Eastern states get more attention, huge really is a relative term! Australia has less people than California — a single US state — or even Tokyo! South Australia in particular has less people than some suburbs of Singapore! If we do decide to keep states for historical or cultural reasons, at the very least we should federalise most of their responsibilities. There's no reason each state needs to have it's own education, health, road transport or rail system authorities just to name a few. As I said I could spend days talking about this, but I do have other things I'm supposed to be doing; thank goodness for buckling spring keyboards! I'd love to hear what you think about this, in particular why you think I might be wrong. I must be missing something.